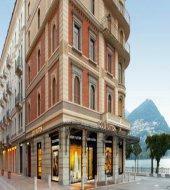 Lugano: international and cosmopolitan city on the lake is an unmissable stop for shopaholics! Via Nassa is a pedestrian street that hosts the elegant shop windows with the best of clothing, watches and jewelery. A day dedicated to the high quality shopping: from luxury items to antiques without forgetting the typical markets along the streets and squares which offer the food of the region. Times subjected to organization and/or traffic problem.